We have been living in Phnom Penh for about 17 months now. 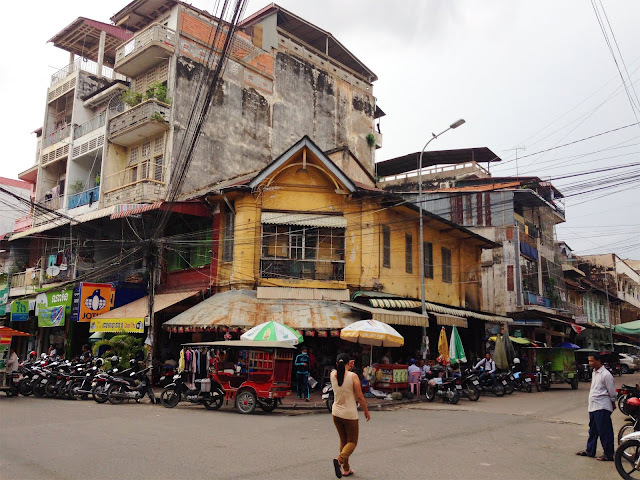 When we first moved to Cambodia, I didn’t have much time or energy to evaluate my new life in this city. Yes, it was hot and dusty, no getting around noticing that, but we needed to find an apartment, find a school, find grocery stores and furnishings and friends and…everything. That took all of my focus. After months of preparation and transition in the US, we began months of transition and settling in on this side of the ocean. There wasn’t a break to take it all in for a while. After a while of living in Phnom Penh, though, I did have time to look around and process it. I’ll tell you something that maybe some missionaries won’t tell you. I realized that I didn’t like it here. I didn’t hate it. I just…didn’t like it. Initially, not liking it here felt fine. Some people really struggle as they come out of a “honeymoon stage” of living in a new place, finding that reality doesn’t live up to the place they fell in love with when they were bright-eyed, excited and naive. I thought, it’s a bonus: there’s no need to struggle to get over the “honeymoon stage” if you never have one. I also realized that most places are hard when you first arrive. I didn’t sweat it. Yet, after months and months, I got to a point where I wondered if I would ever like it here. I tried to like it. I tried not to see the trash, not to hear the construction. I tried to make peace with the endless lines of ants in my apartment, with the bugs in the rice. I tried not to mind sweating all day, everyday. I tried to find it endearing when Cambodians asked me how much I weigh. I tried to build community. I tried to factor out the stress of language learning and culture shock from my impression of my new home. I tried to focus on the things I liked. Pineapples! Cheap housing! Our wonderful tuktuk driver! I never thought about leaving or doubted our commitment to live out our callings here for the foreseeable future, but at one point I finally was honest with myself: I just didn’t like it here. I tell you this to help explain just how weird it is to find myself, with two and a half weeks before we board a plane to head back to the USA for 3 month, conflicted about leaving. It’s a miracle of sorts, really. As my low point hit, we took our planned module away from language school and took a couple weeks off. We saw my brother and his family in the neighboring country where they live and spent some time resting on a beach in Thailand. We didn’t think about Cambodia or Phnom Penh. When we returned home, I continued to pray that God would help me like, even love, living here. Little by little, I felt my heart lift in this place. Going away gave me the chance to come back and have the feeling of coming home. My brain functioned better after some time away from the classroom, and I was able to use my new language skills more in my everyday life. Our lease ran out and we found a new apartment—which doesn’t have a massive construction site next door. Little things started adding up. I now know the people at neighborhood shops that wave to me as I walk down the street. We have discovered fun, tucked-away cafes and restaurants. We finally have the ability to follow along in the hymnals and sing a few songs at church. We find ourselves busy hosting friends for dinner. A few weeks ago we were riding to the other side of town as evening was falling. I love watching the city come to life as everyone returns home or commences their evening activities. As I took in the sunset, got peeks of dinner cooking at corner stands and marveled at the motorcycles carefully balanced with all manner of people, animals, vegetables, I realized: I really like living here. In fact, I like it more and more every day. Yet, as this momentum finally grows, it’s time to pause here and return home for a while. That, too, is a weird feeling. As we return to the States, I have to wonder—will I lose all the momentum I’ve found in liking life here, building community, language learning? After being away for this long, will we still feel at home in the communities we have left behind in the States? Will we be able to communicate the massive changes we’ve seen in the last year and a half? Will we be able to share the stories we have heard in ways that resonate? We’ve already realized that 3 months is a really long time to be away from Cambodia…and that 3 months is a really short time to be back in the US. I feel like, just as I’ve gotten a bit settled, just as I’ve gotten the hang of things here for a bit, the cloud has lifted and it’s time to pack up and move again. It’s a strange, transient journey we are on. Yet, after a year and a half of praying this place would become a place where we could thrive, I’m thankful to feel conflicted to be gone for a while. I’m hopeful that this journey back to the States will help me to be able to return to Cambodia and love it even more. PS. See our blog last week for details on dates and details for our time in the States.